I'm a Physics PhD. candidate student studying solar physics at MSU under Dr. David McKenzie. I completed my undergraduate degree in Physics & Astronomy with a minor in mathematics from Northern Arizona University. I spent one summer at Baylor University and another summer at NRAO headquarters as an REU participant. I also worked as a welder, electrician, and draftsman for seven years after high school at Newport News Shipyard. I'm passionate about teaching and doing public outreach. I've had the opportunity to be lead instructor for College Physics 205 & 207 during the summer semesters. I spent a year working as manager for the Space Public Outreach Team (SPOT), which is responsible for spreading science enthusiasm into public schools all over Montana. I also did a year of service as an AmeriCorps member in Arizona. My time in AmeriCorps was spent tutoring students to pass their GED. I spent the Fall of 2013 doing solar research under an MSGC fellowship and now work as chief observer for Hinode/XRT while finishing my dissertation. My dissertation work has taken me on a journey that explores the environmental conditions that can trigger an energetic solar flare or coronal mass ejection (CME) in the Sun's atmosphere. Both events have huge impacts on space weather, which is of great concern to government agencies like NASA, NOAA, US military, and Department of Defense. The three features that I'm most interested in are coronal null points (CNPs), solar flares, and prominences. CNPs are locations in the corona where the Sun's emerging and twisted magnetic fields connect to create a point or line where the magnetic field is zero. These abrupt changes in the fields' connectivity can results in a possible solar flare or CME. My work tries to place constraints on the lifetime, spatial and temporal distribution, stability, and observability of these features. CNPs can be found by using a magnetogram (a map of the line of sight B field) on the Sun's surface (photosphere) to extrapolate what the B field looks like higher in the Sun's atmosphere. 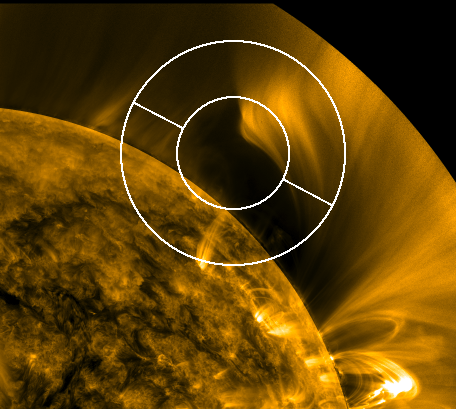 Once the locations were found, an extensive search can be conducted to find evidence of their existence in observational data from NASA's Solar Dynamics Observatory (SDO) satellite. Unfortunately, present methods for observing the Sun only allow for a determination of the magnetic field strength at the photosphere. However, one of the additional benefits of looking for CNPs is to gauge the fidelity of the presently used solar models, when using this limited amount of magnetic field data. This research was possible for the first time due to the continuous ultraviolet coverage of the entire Sun by SDO at 12-second cadence. I've compiled and posted an extensive catalog of observed CNPs that cover the first three-years of SDO operations for the solar community (see link below). All of my initial research on this topic has been published in Solar Physics during the fall of 2014. Solar flares are the most energetic events in the solar system, which can release an average 10^25 joules of energy during a single event. These flares also have the possibility of being associated with harmful CMEs. Understanding how or more importantly when a CME will occur is very important for the safety of astronauts and satellites working in space. The corresponding geomagnetic storm can also damage power grids and corrode oil pipelines located at high latitudes on the Earth. However, a back of the envelope calculation from our present understanding indicates that a magnetic field would require a diffusion time of 3 years to produce a solar flare. This is in huge disagreement with the observed 300 seconds needed for producing a solar flare. My research is focused on reconciling this difference by exploring how turbulence can play a role in the magnetic reconnection process to initiate a solar flare. The motion around a flare site is investigated by applying an "optical flow" code to track plasma motion. This enables me to quantify how turbulences can decrease the time required for reconnection by examining the cascade of energy, vortices, or diffusion at different spatial and temporal scales. The same technique is also being used on quiescent prominences to help quantify why they might suddenly erupt and produce a CME.